﻿Published by Sareth Ney on Feb. 6, 2017 at 6:19 p.m. 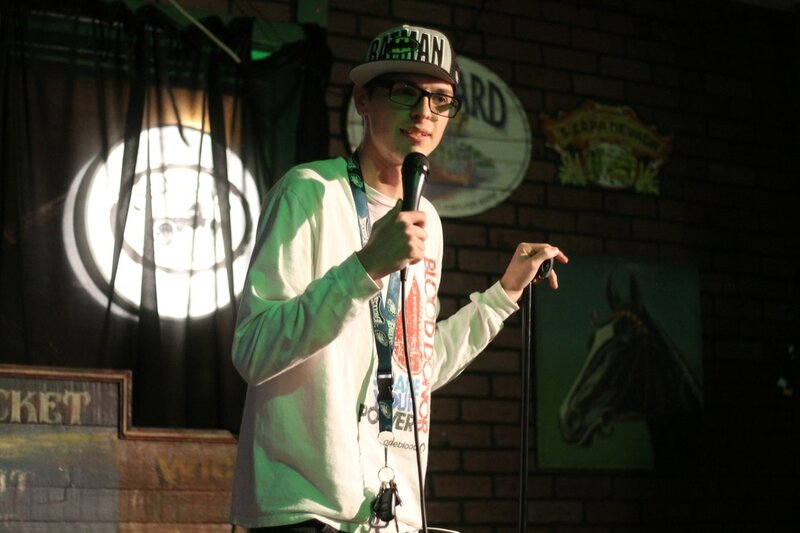 Updated on April 6, 2019 at 2:47 p.m.
CASSELBERRY, Fla. – Blake Butler had yet to attend a comedy show and did not have an inspiration to perform stand-up. However, he knew he was funny and wanted to give it a try. From the first time he attempted it, he was unaware as to how much he would fall deeply in love with it. When Butler first attempted stand-up comedy, he recalled he received laughter with certain jokes throughout. He continued to say he would never attempt the jokes again. After talking to his fellow peers about what their first time was like, his experience was much better than theirs. He also remembered clearly the very first showcase he was part of and the first time he performed at the Orlando Improv. To him, they were two of the best of times. “I could do this for a living,” Butler went onto say with the two experiences. “I’m good enough”. Overall, Butler has been a stand-up comedian for one year. After each performance has comes to an end, he wanted to make sure his audience enjoyed themselves for the times they shared. His goal was to make as many people laugh as possible. Anthony Jeselnik’s “Thoughts and Prayers” was cited as Butler’s current favorite comedy special. He admitted both of their comedy styles were opposite. However, he loved and respected the way he delivered his jokes in a merciless kind of way. His favorite sketch show was “Saturday Night Live” and his favorite sitcom was “The Office”. If Butler could embark on a tour with a well-known comedian, he chose Louis C.K. He felt he could learn a lot from him and teach him ways to be a successful comedian. Locally, he selected Vinny Santino. Their styles differentiate from each other to the point where they could put on a series of remarkable performances. If he could get roasted by a set of past or present comedians, Butler picked: Jeselnik, Mike Lawrence, Jeff Ross, Jimmy Carr and Bill Burr. Other forms of comedy Butler plans to venture off into include writing for a television show and states it can be an amazing experience. Since he utilizes crowd work into his stand-up comedy routines, he also pictures himself trying improv. In the next five years, he hopes to perform stand-up comedy at venues outside of Fla.
On social media, Butler can be found on Facebook and followed on Twitter (@thecomicbutler).